'Paintings for Sale' read the roadside sign that first drew the occasional passersby into Maud's one bedroom painted house. 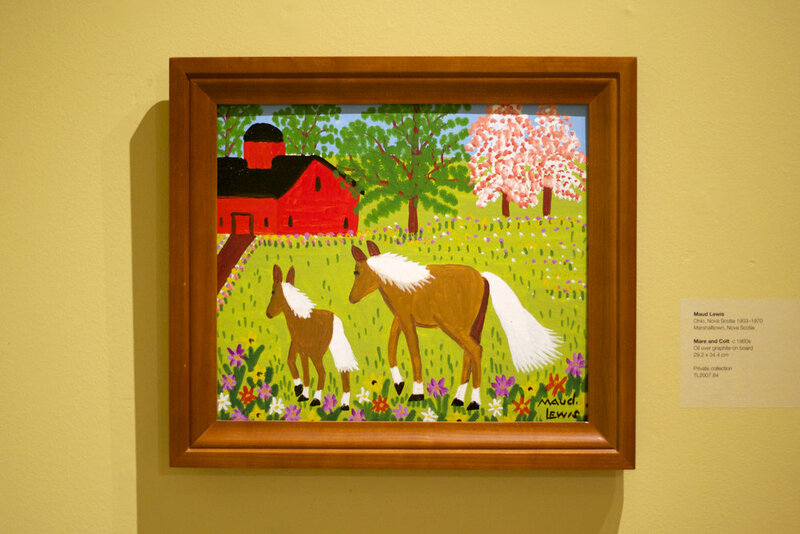 Once the word spread, more people started stopping from near and far to purchase her charming, cheerful folk art compositions on Christmas cards, cardboard & scrap particle boards. 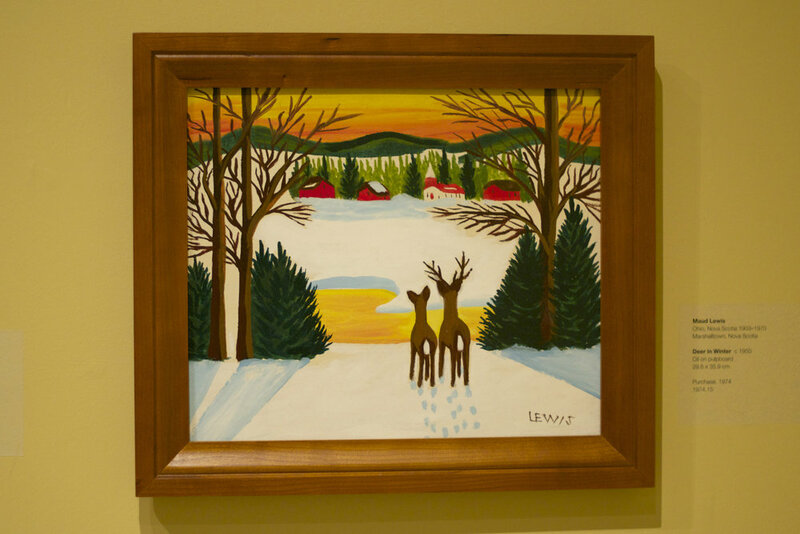 Although untrained and naive, Maud Lewis portrayed her typical daily life in her paintings with creative passion, a childlike wonder & playfulness, and an extraordinary artistic talent. Light and colour in her work show balance and harmony much like masters of the craft. 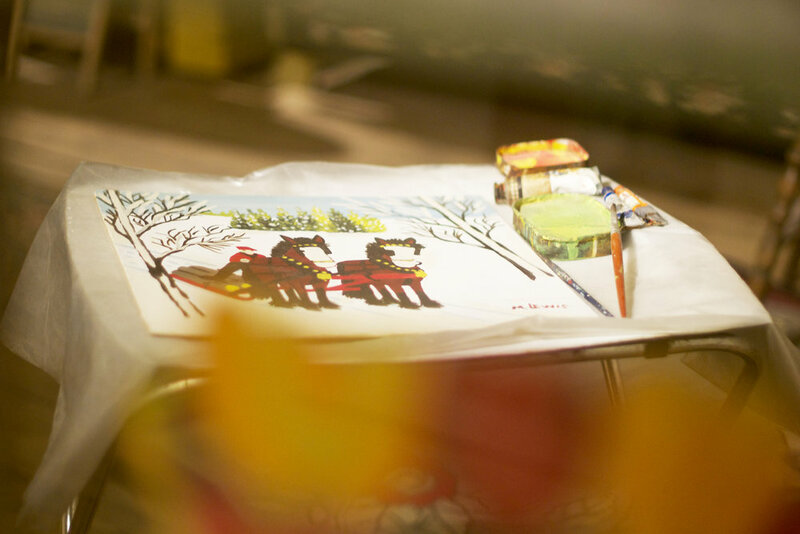 Working with crude tools like old bristle brushes, leftover house or boat paint and sardine cans as palates did not curb Maud's enthusiasm or her ability to create bright joyful works of art. 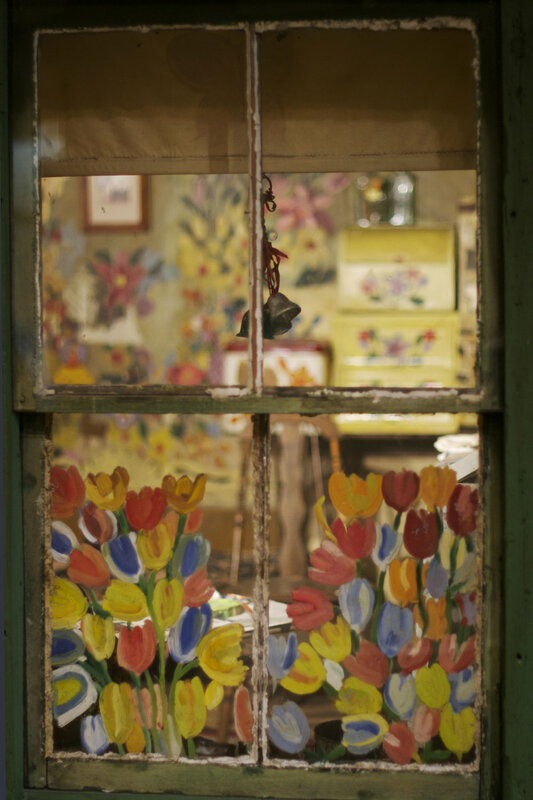 Maud & her husband Everett's humble cottage home became her canvas and she painted almost everything. If it had a surface that was flat, Maud painted it. 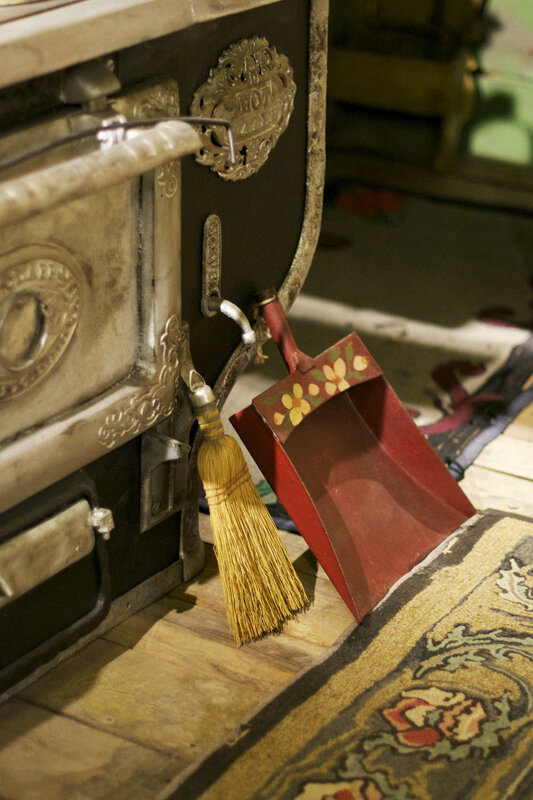 She adorned their tiny house with colourful pretty flowers, whimsical birds and beautiful butterflies. This little painted house has become her legacy. It truly is a 'hidden treasure' in Nova Scotia and one you should not miss. After her death and subsequently her husband's death, the community of Digby knew this extraordinary home needed to be saved. 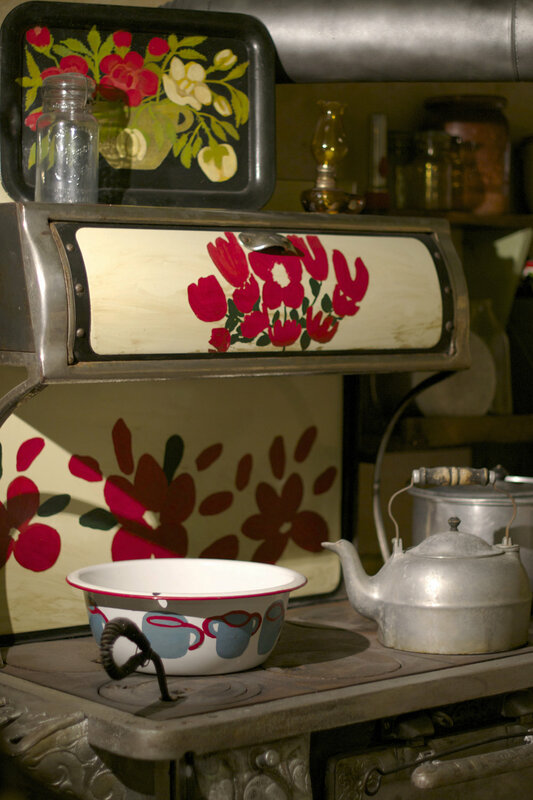 You can enjoy Maud's tiny painted home up close and personal as well as view the largest collection of her artwork at the Maud Lewis Gallery, a permanent exhibition at the Art Gallery of Nova Scotia. I wonder what Maud would make of all of this? Creating and sharing her work made her the happiest when alive, so I like to think she's smiling from above seeing all the joy her artwork has brought to those who come to enjoy her dedicated gallery. Thank you Maud. It's a gem! The Art Gallery of Nova Scotia is one of the premier arts institutions in Canada & the largest art museum in Atlantic Canada. AGNS engages people with art in two locations: downtown Halifax & Yarmouth and currently holds more than 17,000 artworks in its' permanent collection. Thanks to the combined efforts over the years by the Maud Lewis Painted House Society of Digby, the Province of Nova Scotia, Federal funding from the Department of Canadian Heritage, Scotiabank, private donations and the Art Gallery of Nova Scotia, Maud's little painted house has been carefully and painstakingly preserved & restored then rebuilt in a specific gallery honouring this Nova Scotian artist ~ one of Canada's most important folk artists.